Have you ever just wondered why your kids seem to behave a lot better whenever you’re not around to watch over them? If you’re like any other mom, then it’s likely that you would have noticed this already. It’s almost universal knowledge that kids have a tendency to really act out and misbehave whenever their moms are around. But why is that the case? Is there a scientific reason for this? Is it all in your imagination? Well, no. It’s not really all just a result of your imagination. In fact, there is research that actually delves into this topic in-depth so that people (mothers in particular) are able to understand this phenomenon better. 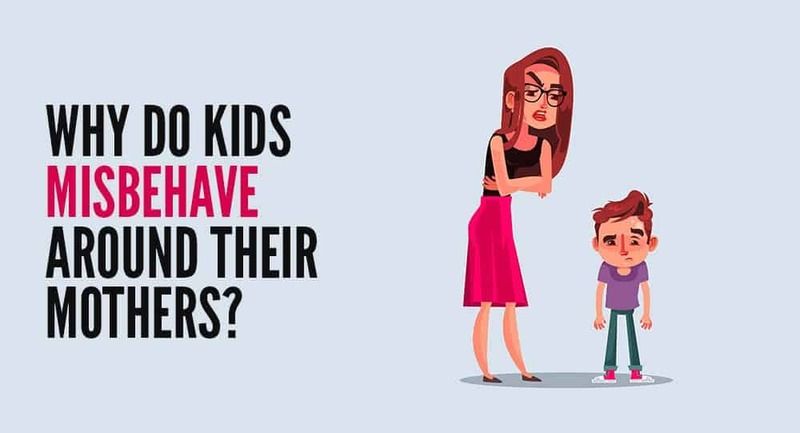 Many psychologists have affirmed that these experiences aren’t merely anecdotal and they say that there is a very clear reason as to why kids act this way around their moms. And as a mother, it might be important that you also understand as well so that you can gain a better understanding of how your child’s mind works. Why is it that your kid just seems to be a million times worse whenever you’re in the same room as them? When a child grows up in a happy and healthy home environment, then that kid knows that home can always be seen as a haven. They can consider the household be a place of safety and sanctuary. Yes, these kids might know that there are certain repercussions that come with misbehavior. They know they might get reprimanded for running around with scissors or for leaving their toys splattered all around the living room floor. They also might understand that physically hurting a sibling might result in them receiving a scolding from their parents. But in spite of all of that, a child is always going to know that a home is a place where they are allowed to feel safe and secure. They will always know that you would love them no matter what happens. And that is precisely why a child tends to misbehave whenever you are around. They feel safer and they don’t feel that much fear whenever you’re there. For instance, when a child is left to be at school, they do their best to suppress their impulsive behavior so as to appear normal and accepted in that unfamiliar setting. In simpler terms, they are trying their best to fit in so as not to receive any backlash from the people around them like classmates and teachers. They know that they have to work hard to be accepted into that environment. These kids understand that there are certain expectations that they need to meet if they are going to be in various social environments or else they will be outcasted. But the moment they get home, they know that the expectations aren’t going to be so high and they feel more comfortable with letting their true selves out. And it’s not really their fault that they misbehave like that whenever they’re at home. It’s a really big challenge for them to keep control over their impulses for a prolonged period of time. But the moment you’re around, they don’t feel the need to control these impulses anymore. They trust you to accept them for who they really are regardless of how they act. They believe that you would still love them even if they let their imperfections shine. Whenever they are in sight of their mothers, kids will be able to relax a little bit. They don’t feel the need to control themselves as much and they can really act on their impulses and intuition. You are still going to love them even if you get upset at them. They are mostly sure of it. And if you want to know how to better handle this situation, then heed this piece of advice: just let them be for a little while. Allow them to be who they are as a form of release. It relieves them of the pressure that they put on themselves whenever they are outside of the house. So, don’t think it to be too weird that your kid just doesn’t behave whenever they’re at home with you even though they are capable of doing so in other settings. It’s just not the same. It’s a different environment for them and kids are always good at adjusting to their environments. Just remind yourself that you are doing the right thing by encouraging your child to be who they really are. But also make it a point to stay stern and strict. You don’t want to have a child just walk all over you because that can breed a false sense of entitlement. Parenting is hard. But you just have to keep at it! It’s always a learning process and you will figure things out more as you go.